From postcards and mini comics to key rings and even soap (yes I know!) there are many ways to promote yourself at conventions but there’s one method that’s ubiquitous: The convention flyer. Flyers are excellent conversation starters. Heck, for many attendees, the flyer is a welcome substitute for any sort of verbal communication. And that’s why I like flyers. For people who aren’t comfortable with one-on-one conversation (and that’s a pretty healthy percentage of convention-goers) the flyer can accomplish everything you want to get across — with zero personal interaction. And that’s just fine. If they keep walking, smile and nod and remain friendly. If they pause and start reading the flyer SHUT UP and let them read. If they initiate a conversation, lead with your 30-second elevator pitch (if it’s appropriate). Otherwise, just engage in friendly chit-chat. You’ve stopped them. That’s an incredible feat with as much visual and audible stimulation that you’re competing with. Your job now is to be friendly. Never, ever make disparaging, sarcastic or otherwise negative comments if someone doesn’t stay and chat. Why? Because I see it happen all the time. The person walks away with my flyer, reads it sometime later, and then comes back to find out more (or even initiate a purchase). Making a flip comment while the person was walking away would have killed that. Most of the time, I’ll print a batch of flyers specifically for one show, and I’ll include a map of how to find my booth/table on the show floor. …But you’ll have to buy separately for each convention. That’s going to mean you can’t print them in advance, but remember, you can always ship them to your hotel. Flyers can be made incredibly cheaply. You might find a good deal can be made with a local print shop. Otherwise, there are several companies online that can do the job well. In the past, I’ve used VistaPrint, Overnight Prints, Next Day Flyers, PS Print and Boss Logo. They all do high-quality flyers, business cards, postcards and bookmarks. OVERNIGHT PRINTS offers a loyalty program that offers special pricing to members. The more you order, the more points you earn. You can use those points to graduate to higher tiers (and higher savings). VISTAPRINT has a premium member service, too. Just keep it cheap and within your budget. If you decide against using a convention map, buy in bulk at a cheaper unit-price and use them throughout the year. Flyers are a great way to quickly give people an overview of your comic. When you’re designing the flyer, provide as many samples of your best work as you can legibly fit, and don’t forget your URL. Consider placing your URL in several places on the same flyer to maximize the chance that people will be able to find it. Aside from a brief written synopsis of the concept behind the comic, there should be very little else on your flyer. Remember, the more stuff you try to fit onto that space, the less room you’ll have for your samples — and the samples are the most important things on the flyers. • The samples are the most important elements on the pages. They are the biggest, they command the most attention, and they form the largest visual unit on either side of the page. • I’ve chosen my samples very carefully. Each one is a gag that requires little (or no) background information to enjoy. They’re standalone gags. And they’re topics that I think the typical attendee at that particular convention would probably gravitate towards. • My URL appears several times on either side of the flyer — top, side and bottom. It’s the second-most important visual element. 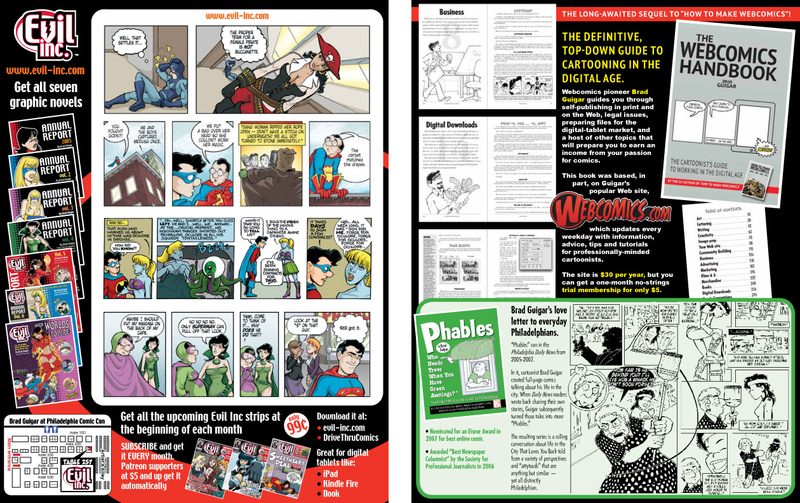 • Graphic novels and monthly e-comics are the third-most important elements on the flyers. Why? Because I’ve sunk money into attending this con in hopes of selling those things! Once my comic has (hopefully) hooked the attendee, it’s time to get down to business. 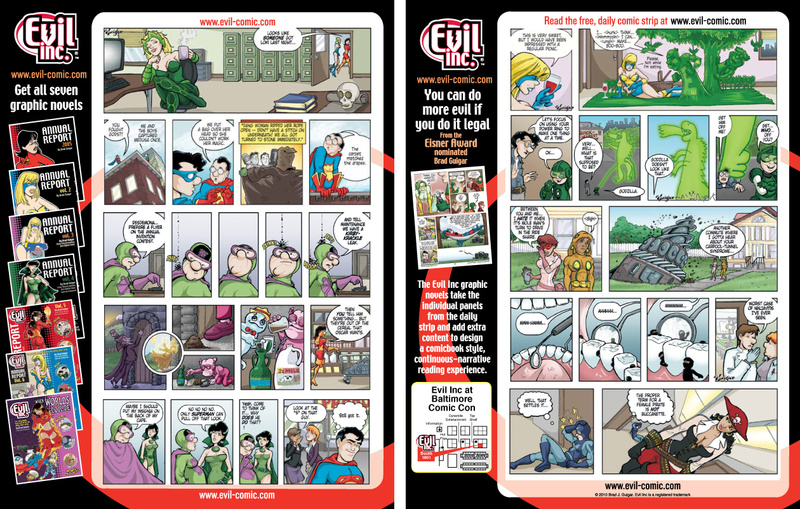 Dave Kellett has an excellent technique that he used in designing flyers for his comic, Sheldon. 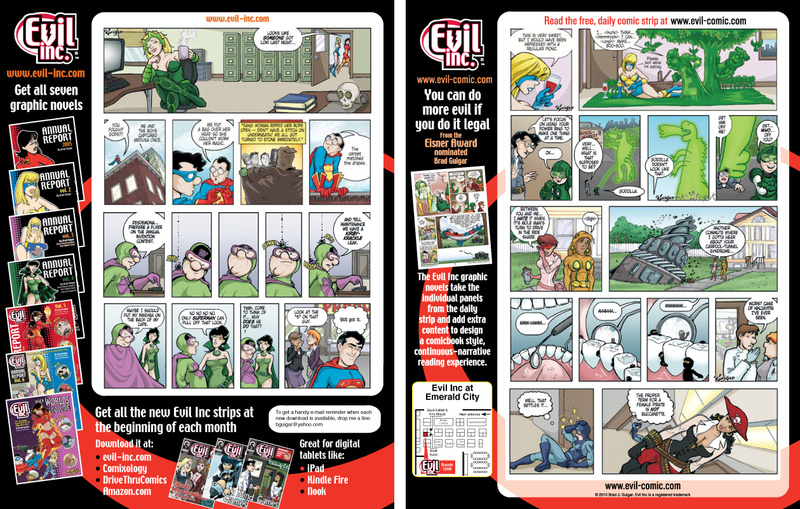 On one side, all of the comics were chosen to appeal to as wide an audience as possible. They were all-ages, broad-appeal, family-style humor strips. On the other side were strips with a heavy sci-fi and/or pop culture topic. Then, he’d watch who was passing his booth. If it was a mom who was there because her kids wanted to see the convention, he handed a flyer to her with the first side facing up. If it was a guy with Spock ears, a lightsaber and a Batman shirt, he would hand the flyer to the fanboy with the opposite side facing up. One flyer was able to target two different types of convention goers. I only steal from the best. So, after the Webcomics Handbook came out, I realized that my flyer had to do double-duty as well. One side had to pitch the comic, and the other side had to showcase the new tutorial. Not only that, but I was exhibiting in Philadelphia, and that meant that my collections of Phables comics would be of particular interest to the locals. So I made my flyer do triple duty.